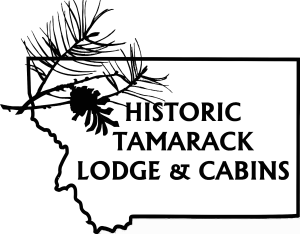 Our lodge room accommodation is located on the upper floor of the original Historic Tamarack Lodge. All rooms have allocated parking in close proximity to a private, ground floor entrance. Lodge rooms were sympathetically refurbished in 2013 and feature lofted ceilings with exposed logs and beams and creaky floors, along with added modern amenities such as air conditioning, attached baths, wireless internet, flat screen TV, coffee maker, microwave and refrigerator. The Moose Room and the Grizzly Room have shared access to a covered balcony overlooking the front of the lodge and lodge room guests also have exclusive 24-hour access to the lodge great room with its original stone fireplace, leather furniture, and cozy atmosphere, making these rooms a great option for a wedding party or group booking needing a little extra space to get together. Due to the historical structure of the lodge these rooms are not ADA compliant, and guests who have restricted mobility should call us to discuss alternative options. Located at the front of the lodge, the Grizzly Room provides two queen beds. 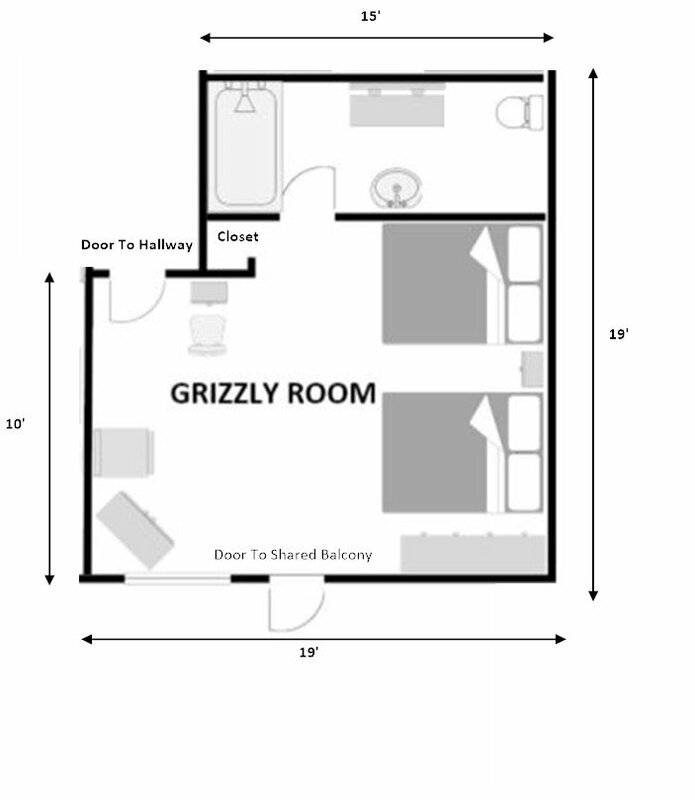 The Grizzly Lodge Room shares a large, covered balcony with the Moose Room, making these two rooms a great option for groups up to six traveling together. Situated just up the stairs on the second floor of the original Historic Tamarack Lodge, Lodge Room accommodation offers access to the lodge great room and a private, ground floor entrance. These Glacier National Park themed rooms include a lofted ceiling, original woodwork, coffee maker and microwave, a/c, wireless internet, and private bathrooms. 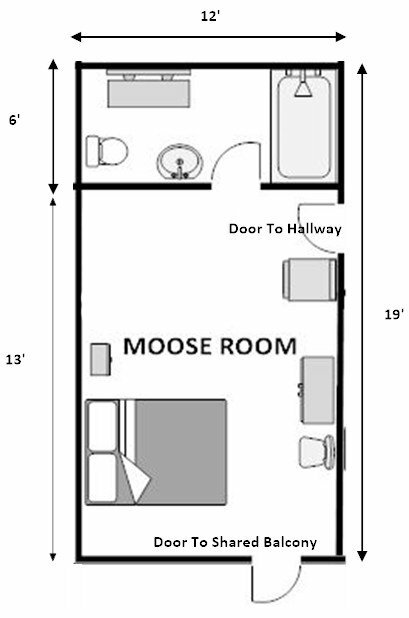 The Moose Lodge Room provides one queen bed for travelers to enjoy lodge living. Located just up the stairs on the second floor of the original Historic Tamarack Lodge, Lodge Room accommodation offers access to the lodge great room and a private, ground floor entrance. These Glacier National Park themed rooms include a lofted ceiling, original woodwork, coffee maker and microwave, wireless internet, a/c and private bathrooms. 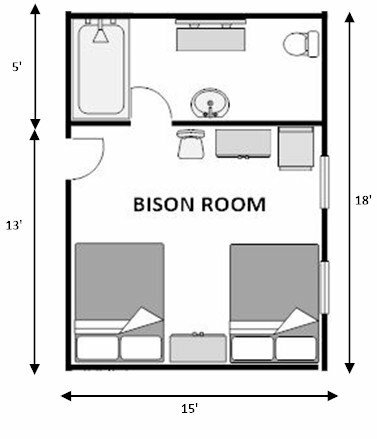 The Bison Lodge Room provides two queen beds for travelers to enjoy lodge living. Located just up the stairs on the second floor of the original Historic Tamarack Lodge, Lodge Room accommodation offers access to the lodge great room and a private, ground floor entrance. These Glacier National Park themed rooms include a lofted ceiling, original woodwork, coffee maker and microwave, wireless internet, a/c and private bathrooms. 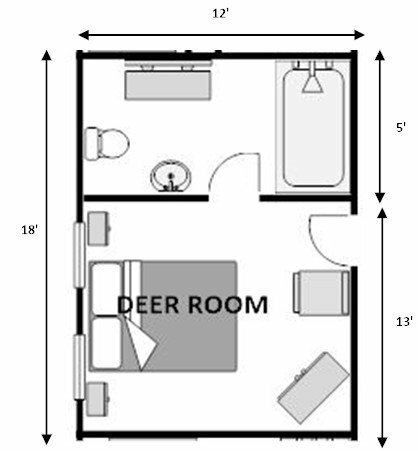 Our Deer Lodge Room has one queen bed for couples and solo travelers to enjoy lodge living. Located just up the stairs on the second floor of the original Historic Tamarack Lodge, Lodge Room accommodation offers access to the lodge great room and a private, ground floor entrance. These Glacier National Park themed rooms include a lofted ceiling, original woodwork, coffee maker and microwave, wireless internet, a/c and private bathrooms.